If you’ve been buried in your work, it’s possible that you missed the release of Sketchup 2014 on February 28, 2014. With the rollout comes some pretty awesome new features so we’re here to break it down and feed you the tasty stuff. If you’d like to simply go and download the latest version checkout our page showing how to get google sketchup free. BIM Capabilites – You can now tag geometry in your model to let sketchup know if something’s a wall, roof, floor, etc. This helps when transferring to other programs that understand 3D elements in that manner. New 3D Warehouse – The 3d warehouse got a face-lift and we have to say, it’s looking pretty good. It’s now easier to browse and shows more helpful information. Checkout how I use the new 3d warehouse in this video on how to keep your sketchup file sizes down. There’s also a really awesome new embed code for components so you can feature them on a website. As an aside, if you’d like us to host the embedded code of your model on our website, just ‘like’ our facebook page and leave us a request by posting a comment with a link to your model in the 3d warehouse. Some manufacturers have placed some of their products on the 3d warehouse as well, making it easier then ever to create convincing, accurate models. Harder, Better, Faster, Strong – Things should be quicker now with the sketchup 2014 roll-out. Some of the code was tweaked to increase performance. The Extension Warehouse – Now there’s a quick and easy way to add plug-ins. It has a great user-interface and things are easy to find and sift through. 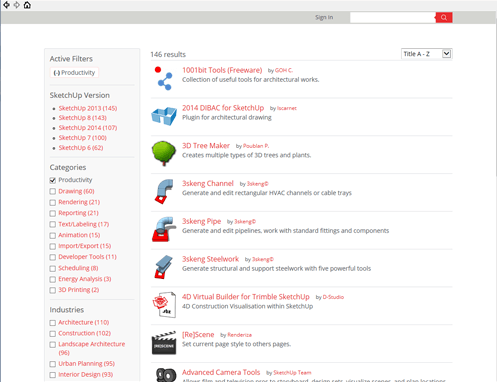 Have you tried out Sketchup 2014 yet? What’s your favorite new feature? Let us know below! If you’d like to start learning sketchup view our tutorials page.